This movie, a true story from the Taisho and earｌy Showa eras (1924-1931), portrays two young women intensely discussing their relationship, thus deepening their mutual love and affection. Ten years ago, Sachi Hamano, Japanese female producer and director, depicted the sexuality of old women in the controversial film Lily Festival. The movie was greeted with thunderous applause around the world. Five years ago, Hamano directed Cricket Girl, featuring three short stories of the long-forgotten female writer Midori Ozaki. And now, in Yoshiko & Yuriko, Hamano describes the love and parting of two young Japanese women, Yoshiko Yuasa and Yuriko Chujo, in the early 20th century. The story begins in 1924 (Taisho 13). At that time, Yoshiko Yuasa was a young magazine editor who was studying Russian. She was called “a Samurai in a skirt” and never hesitated to admit that she was a lesbian. Yoshiko later became known as a brilliant translator of Russian literature and plays, such as the works of Chekhov. In addition, Yuriko was a popular grassroots writer. Her first writings appeared at the age of 17, and she was acclaimed by Japanese society as a genius. She married Shigeru Araki when she was 19, and had to simultaneously work at being both a writer and wife. She soon became disappointed with her marriage. Yoshiko and Yuriko hit it off with each other from the beginning and were instantly drawn to each other. The story of their encounter was well-described in Yuriko's most known novel Nobuko. They lived together for seven years, including three years in Soviet Union. They were the first unofficial female visitors to that country. But after they returned to Japan, Yuriko married Kenji Miyamoto, a literary critic who later became the leader of Japanese Communist Party. The marriage was the end of Yoshiko and Yuriko’s relationship. Yuriko and her husband were ruthlessly oppressed by the government during World War II. After the war, she contributed to the peace movement and wrote many new-era novels. She had long been the icon of Japanese Communist Party and thus her relationship with Yoshiko was a well-kept secret. She passed away in 1951. Yoshiko had kept silent about her relationship with Yuriko until a few years before her death, when she gave Hitomi Sawabe detailed interviews over the course of three years. Sawabe then wrote a book based on the interviews, Yuriko, Dasuvida-niya. This nonfiction novel revealed the truth of the relationships from Yoshiko’s point of view. Soon after this book was published, Yoshiko passed away in 1990. Sachi Hamano had wanted to make this story into a film for more than 10 years, but unfortunately, it wasn't possible until now. The film is based on the Yuriko's novel, Nobuko, and takes the perspective of the nonfiction book, Yuriko, Dasuvida-niya. The story of the film focuses on a short period-one and a half months-in 1924, when the paths of Yuriko, Yoshiko, and Araki, Yuriko's husband, cross each other. Yuriko and Araki got married in the United States when she was a 19-year-old student, and they returned to Japan together. After five years of marriage, Yuriko felt very frustrated about her relationship. At the same time, Yoshiko was very depressed by her unsuccessful and heartbreaking relationship with another woman. Yuriko, Yoshiko, and Araki travelled between Tokyo, where they lived, and Fukushima, where Yuriko's grandmother lived. The movie is an emotional drama of both heterosexual and lesbian love. Because both Yuriko and Yoshiko were excellent writers, their words on their “experimental love that has no name” reaches directly into our hearts. And they are full of interesting suggestions. The movie was filmed in October 2010 in Shizuoka prefecture, where Sachi Hamano grew up. Only the mountain and the lake in Fukushima were filmed in that prefecture. This film was supported by volunteer groups. Supporters of Sachi Hamano, Tokyo, represented by Jun Khadkachhetri, raised money for the film. 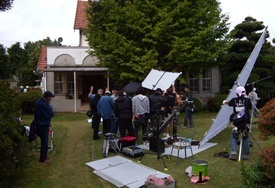 Supporters of Sachi Hamano, Shizuoka, represented by Utano Ishigaki, largely sustained the filming in Shizuoka. Yoshiko was born in Kyoto in 1896. She started studying Russian when she was 19. She fell in love with a female writer named Toshiko Tamura. At the age of 24, she lived with a geisha girl in Kyoto named Sei Kitamura. After breaking with Sei, she met Yuriko in 1924. They began living together in 1925. Yoshiko went to Soviet Union with Yuriko in 1927 to study Russian and stayed there for three years. Their relationship ended soon after they came back to Japan. Later, Yoshiko became a well-known Russian translator and pursued her craft for many years. She died in 1990. Yuriko was born in Tokyo in 1899. Her maiden name was Chujo. She debuted as a writer when she was 17. At the age of 19, she married a scholar, Shigeru Araki, fifteen years her senior, whose major interest was Ancient Persian. Five years later, she met Yoshiko and divorced Araki. After living with Yoshiko for seven years, she married to Kenji Miyamoto and remained a successful grassroots writer. She died in 1951. Hamano was born in Tokushima in 1948 and grew up in Shizuoka. She made her directorial debut in 1971. In 1984 she founded her own production company, Tantansha. Since then, working as both producer and director, she has released over 300 films portraying sexuality from the female perspective. In 1924 (Taisho 13). Yoshiko Yuasa (played by Nahana) worked as an editor for a magazine called Woman’s Love of Country while studying Russian. A famous female writer, Yaeko Nogami (played by Yoriko Doguchi), introduced Yuriko Chujo (played by Hitomitoi) to Yoshiko. Yuriko was a popular grassroots writer. Her first writings appeared at the age of 17, and she was acclaimed by Japanese society as a genius. While she was studying in New York at the age of 19, she married a scholar, Shigeru Araki, fifteen years her senior, whose major interest was Ancient Persian. When Yuriko met Yoshiko five years later, their marriage had grown very frustrating. Yoshiko and Yuriko were instantly drawn to each other. But Yoshiko was a woman who openly said “I love women like men do.” They soon established passionate relationship and intensely explored their connection to determine if it was love or friendship, thus deepening their mutual love and affection. But for Yuriko’s husband, Araki, their relationship was a shocking development that might irrevocably damage his life. At the age of 20, Araki had gone to the United States, where he studied for fifteen years. Thanks to Yuriko’s parents, he returned to Japan and became a university professor. He would have done anything not to lose Yuriko. In this movie, Yuriko, Yoshiko, and Araki travel between Tokyo, where they lived, and Fukushima, where Yuriko’s grandmother lived, portraying an emotional drama of love and hate, both heterosexual and lesbian.